Amy Logan is a Vancouver editor and writer with over two decades experience in the educational field. She works as the head English Tutorial Instructor at Columbia College and blogs at hardstare.blogspot.com. 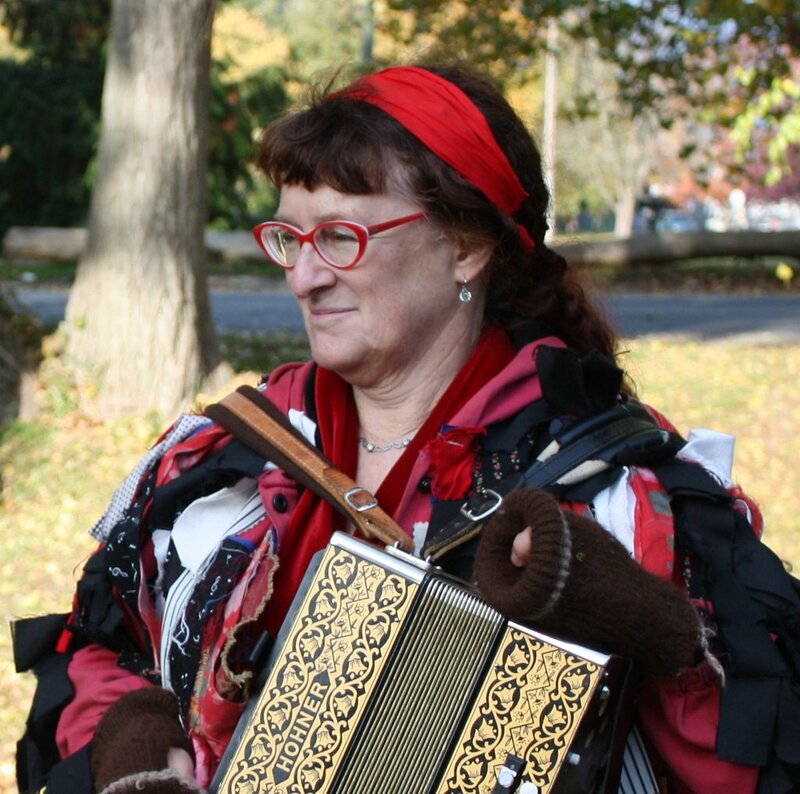 She was a singer in the band Revealing Grace for several years and co- hosted a local open stage, and she is a founding member of the Vancouver Finnegans Wake Reading Group . An avid gardener, she lives in a lanehouse in Strathcona and promotes locally-sourced wood projects through photography and social media. On her two-hour daily bike rides around the city, she often forages for flowers and herbs and posts photos of her adventures on Instagram as @hardstare. Her photography has won prizes both with BC Ferries and Amtrak. She is committed to promoting art and community-based activities that support the environment and bring people together creatively. Belva Stone is an early childhood educator with a deep love for the outdoors. A twenty year veteran of the early childhood education field, she holds both a Montessori Diploma and a Forest School Training Certificate along with her ECE Certification. 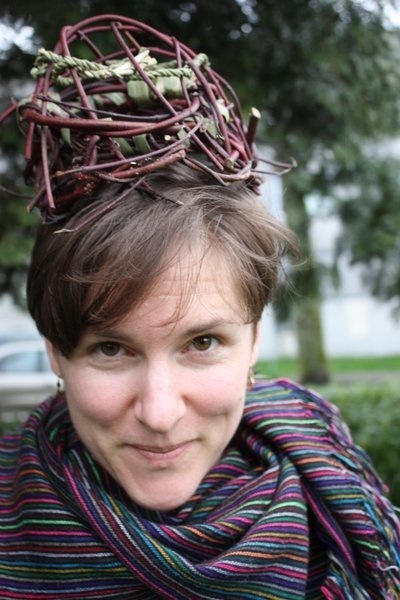 As director of Muddy Bootprints Outdoor Early Learning program, Belva is pioneering outdoor learning in an urban setting, connecting children with nature by being in local Vancouver parks. Belva also holds a certificate in physical theatre from Dell’Arte International in Blue Lake CA, and infuses her love of singing, dancing, and laughing throughout her life and work with kids. Bill Beauregarde is Cree / Metis from the Enoch First Nation base in Alberta. He has made and performed with masks, puppets and stilts, and worked as technical director (CHAOS festivals), house technician (Green Fools Theatre, Calgary), and set-builder (Jubilations Dinner Theatre, Winnipeg). Since moving to Vancouver in 2011, he has worked with Vancouver Moving Theatre as a design and making assistant (The Big House and Realms of Refuge) and as production staff (Downtown Eastside Heart of the City Festival) and with Theatre Terrific as co-director, designer and puppet-maker of Hidden Stories and co-set construction of Egni’s Eye. Bill has served as Coordinator of Cultural and Community Programs for the Aboriginal Front Door Societ, and as community drop-in coordinator at DTES Neighbourhood House. He studied in Edmonton, Alberta at the University of Alberta and the Victoria School of Performing and Visual Arts. Jason Jones (Ph.D., R.P.Bio.) is a terrestrial ecologist with more than 20 years of experience. For the past 5 years he has worked as an environmental consultant, primarily in the energy sectors in Canada, the United States, and Mexico. In this capacity, Jason has worked on close to 300 energy, transmission, and mining projects. His responsibilities include experimental design, data analysis, environmental impact assessment and risk analysis, public education, and collaboration with First Nations and Aboriginal Peoples. Jason has had a life-long interest in environmental education and the critical role that citizen science and engagement plays in successful conservation. Prior to his consulting career, Jason spent the better part of a decade as a college professor, and has also worked as a park naturalist in the BC Provincial Park system. Outside of work, Jason is an avid bird watcher, gardener and musician. Nicole Jahraus is a designer and community organizer whose work explores the materiality of our environment and what humans leave behind, and their potential to be transformed. Some of her recent projects include starting construction of an aluminum kayak inspired by traditional Aleut designs, co-creating communal portable saunas, and building community through skill sharing at the Pender Street Mend & Friend. Nicole currently works for a community-oriented and women-led architecture firm in Vancouver. 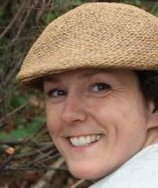 She was project coordinator for community development at Evergreen, and contributed to the board of directors of the Vancouver Tool Library and Sprouts Cooperative. Nicole holds a bachelor’s degree in global resource systems from UBC and a bachelor of environmental design from Dalhousie University. Karen Barnaby has two great passions: spinning and cooking. She will try to spin anything if it looks spinnable and cook anything if it looks edible. By day, she works as the Product Development Chef for the Gordon Food Service Strategic Alliance. She is a Vancouver Sun food columnist, popular Lower Mainland cooking teacher and acclaimed author of four cookbooks. Karen volunteers for Vancouver’s Community Kitchens, sat on the board of the Greater Vancouver Food Bank, and is past president of Les Dames d’Escoffier BC Chapter. She is the recipient of a Minerva Award for Community Leadership and the Back of the House Award from the British Columbia Food and Restaurant Association. Susan Gerofsky brings experience in a number of fields to bear in an innovative and interdisciplinary approach to curriculum theory, mathematics education and environmental education. She holds degrees in languages and linguistics as well as mathematics education, and worked for twelve years in film production, eight years in adult education (including workplace and labour education), and eight years as a high school teacher with the Vancouver School Board. Dr. Gerofsky has been involved in interdisciplinary research and teaching involving mathematics education, garden-based education, applied linguistics, and film. She is one of the founders of the UBC Orchard Garden, a project where teacher candidates and experienced teachers learn to teach across the curriculum outside the four walls of a classroom, with a garden as co-teacher. Rebecca Graham is a weaver and artist of mixed northern European ancestry, and the third generation of her family born in Coast Salish Territory. She studied environmental ethics and agriculture at the University of British Columbia and abroad and holds a BFA from the Nova Scotia College of Art and Design. Rebecca’s work explores the relationship between humans, other species and the land through the history and practice of flax for linen, woven structures, and skins. Rebecca has been the artistic director of the EartHand Gleaners Society since 2014. In 2016, she was the recipient of a Mayor’s Art Award as the Emerging Artist in Craft and Design.